DD Form 1662 - also known as the "Dod Property In The Custody Of Contractors" - is a Military form issued and used by the United States Department of Defense. The form - often incorrectly referred to as the DA form 1662 - was last revised on June 1, 2003. 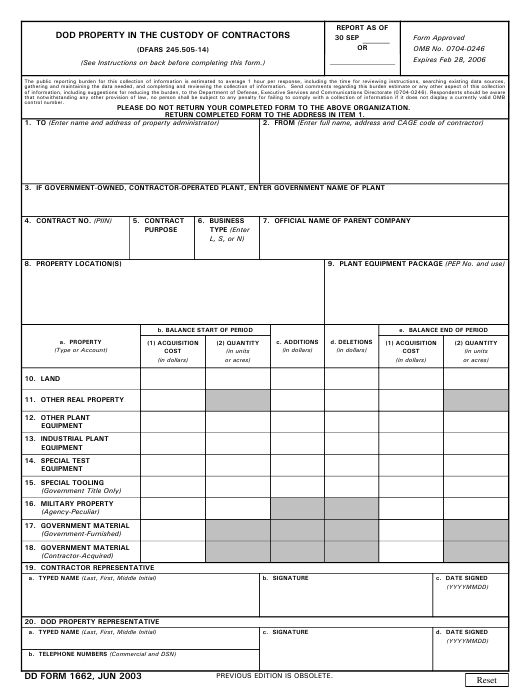 Download an up-to-date fillable DD Form 1662 down below in PDF-format or find it on the Department of Defense documentation website. PLEASE DO NOT RETURN YOUR COMPLETED FORM TO THE ABOVE ORGANIZATION. RETURN COMPLETED FORM TO THE ADDRESS IN ITEM 1.
when no DoD property remains accountable to the contract. City, State and Zip or the Military Installation or the Foreign site. Limit input to 69 characters. NOTE: Can be used as a "REMARKS"
Subpart 45.5 and DFARS Subpart 245.5.
mailing address (including City, State, and ZIP+4). each type of property as defined in FAR 45.5 or DFARS 245.5.
contractor with the Division name stated after the Corporate name. previous year for BALANCE AT END OF PERIOD. BALANCE AT END OF PERIOD. not enter for Government Material or Military Property. Government Material or Military Property. type of property as defined in FAR 45.5 or DFARS 245.5.
reflected on inventory records in accordance with FAR 45.505-3.
system to sign this report.